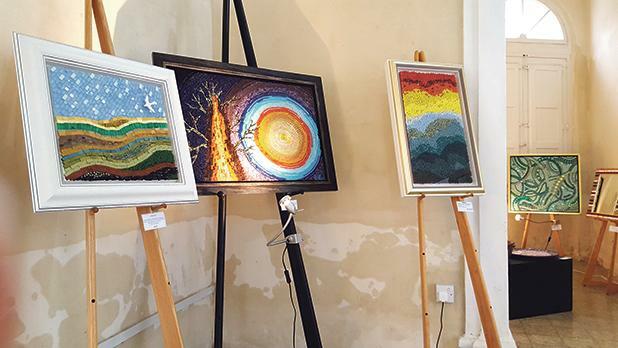 A solo mosaics exhibition by Paulene Attard entitled A Shattering Presentation of Colours and Textures is on display at Casino Notabile, Rabat, on Saturdays and Sundays until December 7. The artist’s latest creations, including wall hangings, mirrors, tables, decorative bowls and plates and troughs, using diverse materials such as plain and gold-veined vitreous glass, 24-carat gold glass from Italy, mouth-blown smalti, Murano millefiori, bone china, semi-precious stones and minerals together with recycled broken ceramics and shells, are on display. The exhibition is open every Saturday from 4.30 to 6.30pm and every Sunday from 10.30am to 12.30pm and 4 to 6pm until December 7. Private viewings may be arranged by appointment. For more information, visit www.facebook.com/MosaicsByPaulene.